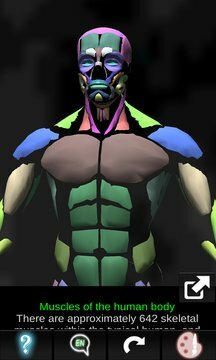 This application displays a three-dimensional model of the muscular system and a description of all the muscles of the human body. Tapping a finger muscle, Corresponding information is displayed. This application is intended to complement the study of human anatomy in medicine, biology or another discipline. Touching every muscle as biceps, chest, triceps, trapezius, deltoids, Achilles, etc. 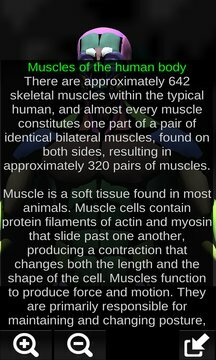 the muscle will illuminate and the corresponding information is displayed. Information about anatomy, practical, useful and valuable in the palm of your hand. Reference to primary education, secondary school, college or culture in general. * Supported languages English, French, Portuguese, Spanish, Russian, German, Dutch, Japanese, Swedish.